Planning a vacation in the Azores? Get a detailed Azores itinerary packed with tips on the best hotels, restaurants and things to do on a holiday in this beautiful island archipelago. Rich in natural wonders, full of tradition and great food, you’d need a lifetime to make a small dent in the bucket list of steaming hot springs, sky-high lakes and regional cuisine of the Azores islands of Portugal. But our food-themed Azores itinerary for the island of São Miguel offers a unforgettable taste of its beauty, flavour and local food in a three, four or seven-day vacation. What is the Best Island to Visit in Azores? The Azores, a lush island archipelago that’s an autonomous region of Portugal, is a splash of nine volcanic islands in the middle of the North Atlantic Ocean. Due to their geographic position between Europe, Africa and America, the Azores have long felt a world apart. Sighted by navigator Diego de Silves around 1427, they served as a stopover for explorers such as Christopher Columbus. Yet, they’re not as remote as they sound. Modern day travellers can reach the Azores via direct flights in five hours from North America and two hours from mainland Portugal via Azores Airlines. Today’s travellers seeking a haven from the crowds of mainland Europe are discovering its appeal. And its surprising affordability. How does lunch for €15 EUR or a luxury hotel with seaview and fabulous breakfast for €125 EUR sound? While all of the nine islands in the Azores archipelago are blissfully off the tourist path, the Azores’ largest island of São Miguel offers the best mix of attractions, luxury hotels, restaurants, local food experiences and breathtaking scenery. 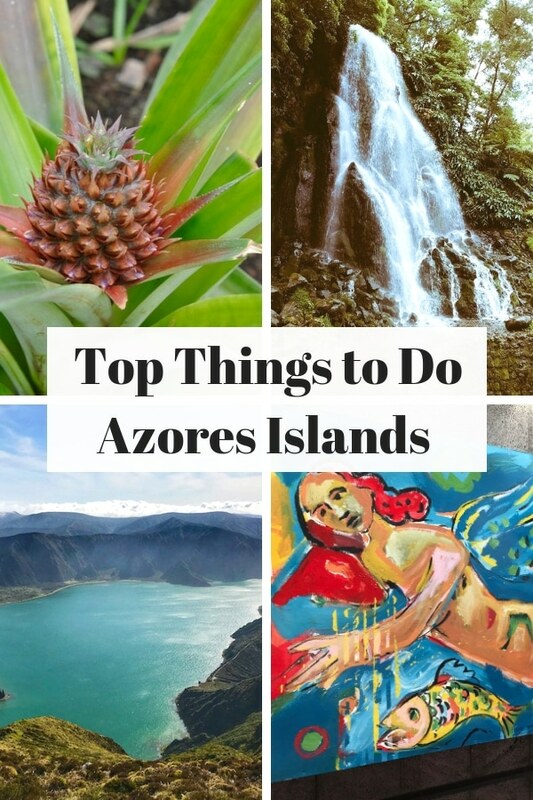 It’s also possible to go island-hopping in the Azores and there’s advice on visiting other islands such as Terceira, Pico and Graciosa in our travel guide at the end of this post. Azores is a year-round destination with spring-like temperatures. Winter temperatures never drop below 10 C and although summer months have the most sunshine, temperatures rarely rise above 30 C.
Summer can see cruise ship crowds on port days so it’s important to try to visit popular attractions such as Caldeira Velha early in the day in order to avoid crowds. November to March are the months with the most rain (132 mm to 118 mm is the monthly average). The driest month is July but fog can be expected at any time. How many days do you need in the Azores? We stayed a full week but it’s possible to stay for a shorter length of time and still have a fantastic vacation. 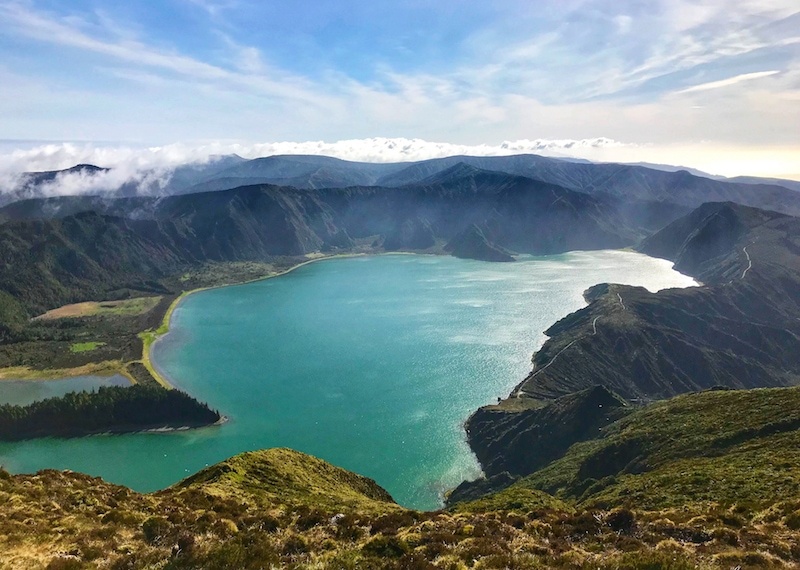 This itinerary is packed with tips on how to experience the best of São Miguel island whether you’re planning a 7-day itinerary or are there for just a few days. Days 1-3 of our Azores Itinerary will give you a good mix of what São Miguel island is known for — from crater lakes to local food. 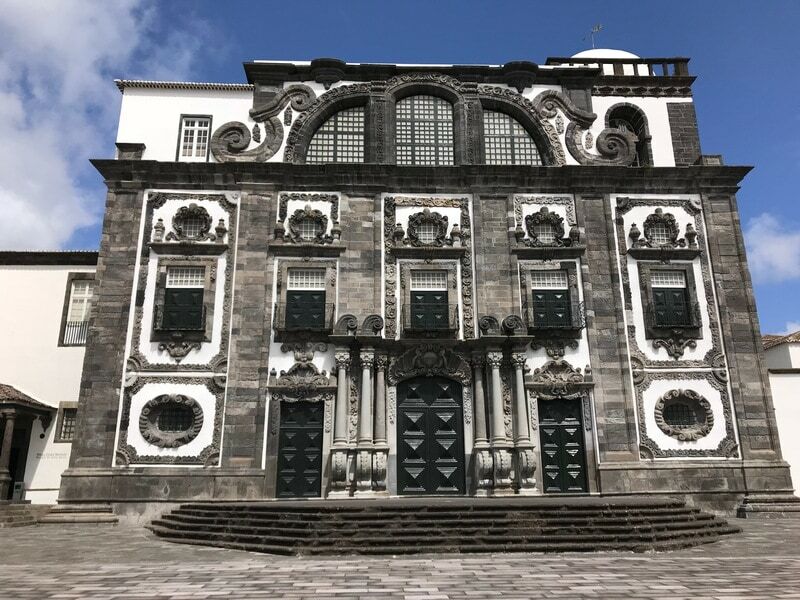 Founded in 1546, São Miguel’s pretty capital city of Ponta Delgada features a seaside promenade, distinctive white and black basalt architecture, a Renaissance fortress and many public plazas. Home to the João Paulo II International Airport, it makes the ideal base for explorations of São Miguel island. Ponta Delgada is also the top spot for making arrangements for other things to do in the Azores. 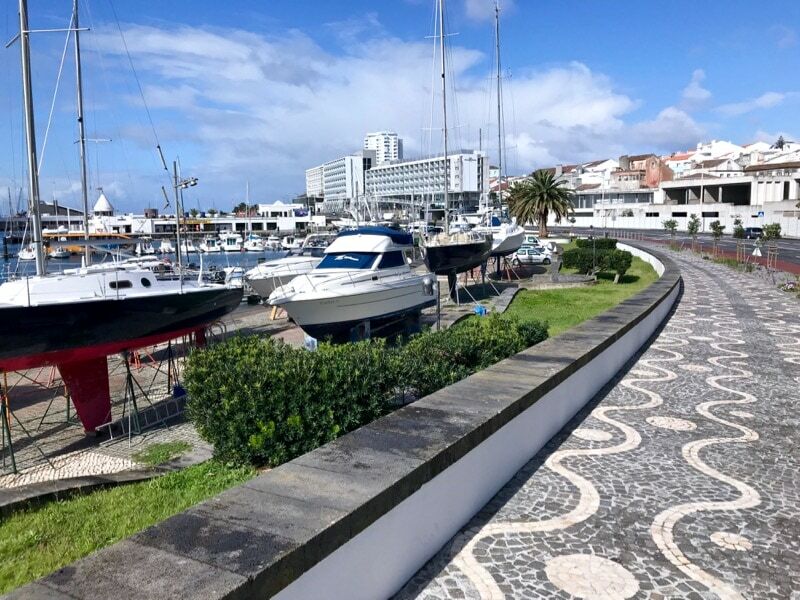 Tours such as whale-watching, hiking and dolphin excursions can easily be booked at the kiosks in the Ponta Delgada marina, also home to the Ponta Delgada Tourism office. Make a stop here on your first day to book your tours for the rest of the week. One of your first stops should be the Carlos Machado Museum where the fine exhibits capture the spirit of adventure from the Age of Discovery. From the size of the bones of the enormous right whale, bigeye tuna and giant swordfish on display within its Natural History Museum, it’s easy to imagine why early mariners described the waters surrounding the Azores as full of unknown creatures. Sample local cheeses, gawk at the pineapples and other fresh local produce, mingle with shoppers and soak up the atmosphere of this well organized and orderly traditional market. This is the place to stock up on cans of tinned fish, perfect for taking back home as food souvenirs. 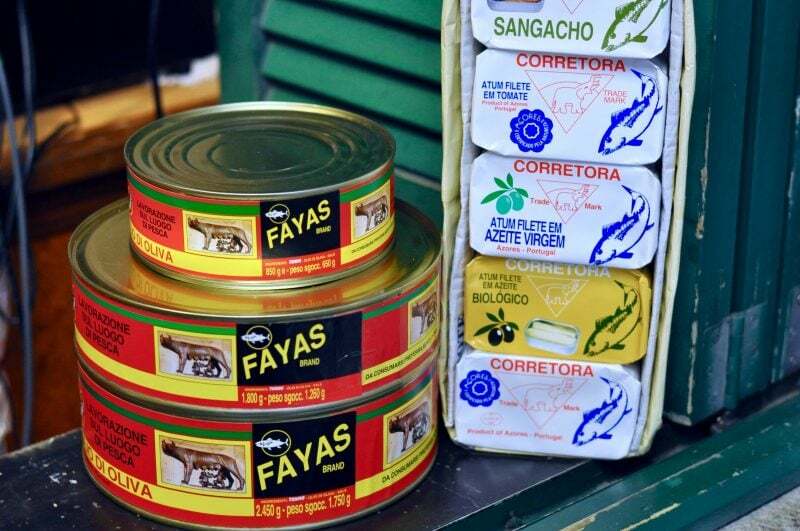 Just don’t expect to see the incredible variety of famous canned sardines you can find in the Conserveira de Lisboa and other food boutiques in Lisbon. I was surprised to learn that the Azores is better known for its tuna and horse mackerel than sardines. Although I wasn’t initially too keen on the sound of horse mackerel, it’s actually an important commercial fish that can be eaten smoked, fried, salted, and baked. It’s a member of the Carangidae family of fish that includes jacks, pompanos and wahoo. There are actually five types of tuna in the Azores and the government has implemented quite strict regulations on the fishing industry to ensure that fishing methods are dolphin safe. In October 2017, The Azores Declaration made a firm commitment to support small-scale, selective and sustainable fisheries and the coastal communities that depend on them for income, nutrition and culture. More treasures await within the Sacred Art Museum, notable for its baroque architecture featuring black basalt and white limestone. These distinctive stones also figure prominently in the intricate patterns of the calçada portuguesa (Portuguese cobblestone pavement mosaics) along Ponta Delgada’s picturesque streets. 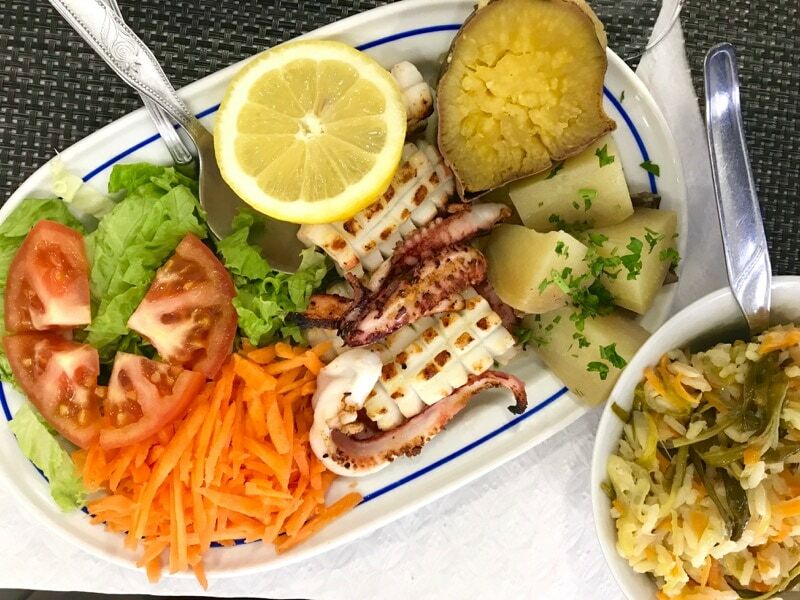 After your stroll, do as the locals do and stop at Restaurante Gastrónomo near the Church of São Pedro. Staying true to its regional roots, the menu features fresh caught fish-of-the-day, octopus salad and espatada (grilled meat on a skewer) as well as local yams, a side dish with every meal. This is also the place to try lapas (limpets) and cracas (barnacles), grilled shellfish bathed in olive oil and lemon juice, accompanied by anise-scented bread for sopping up the juices. Another legacy of the Azores’ rich history is the pineapple, introduced in 1850 following the collapse of the orange industry. Look for this pint-sized but sweet pineapple in local dishes such as black sausage with pineapple, bolo da ananas (pineapple cake) and chutneys. 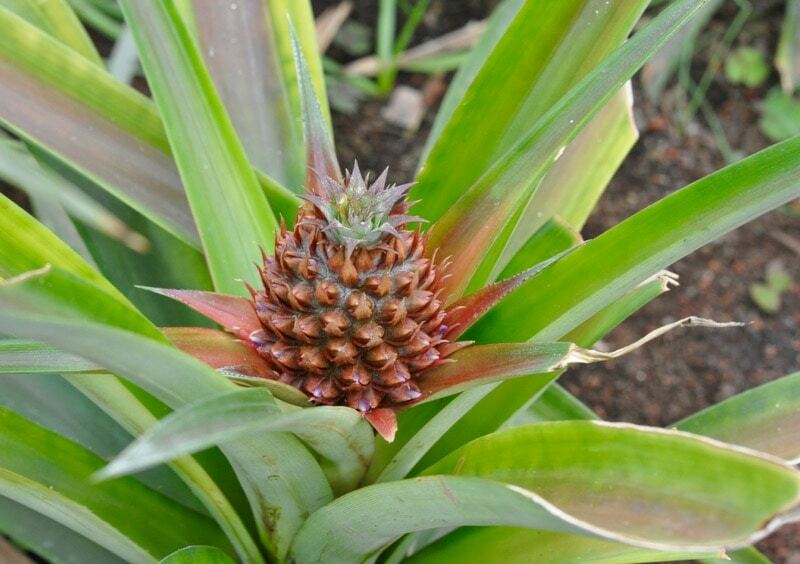 Although many of the original glass greenhouses have been shuttered, the Arrudo Pineapple Plantation offers free tours of its still-operating greenhouses as well as a boutique packed with pineapple-themed souvenirs from food to jewellery. The plantation is a $6.00 Euro taxi ride from the heart of Ponta Delgada. At the modern new Pineapple Cultivation Interpretive Center in Fajode Baixo (a short walk from the Arrudo Pineapple Plantation above), you can browse displays tracing the history of pineapple production in the Azores and watch a documentary on the cultivation processes of this disappearing tradition. It’s still possible to see the vestiges of the Azores’ maritime history. Although 15 forts once protected the island, Forte de S. Bras, located in the modern-day capital of Ponta Delgada on the Azores’ largest island of São Miguel, is the only one still in operation. Active through WWI and WW2, its military museum is open to visitors and displays artifacts such weapons, uniforms and artillery. 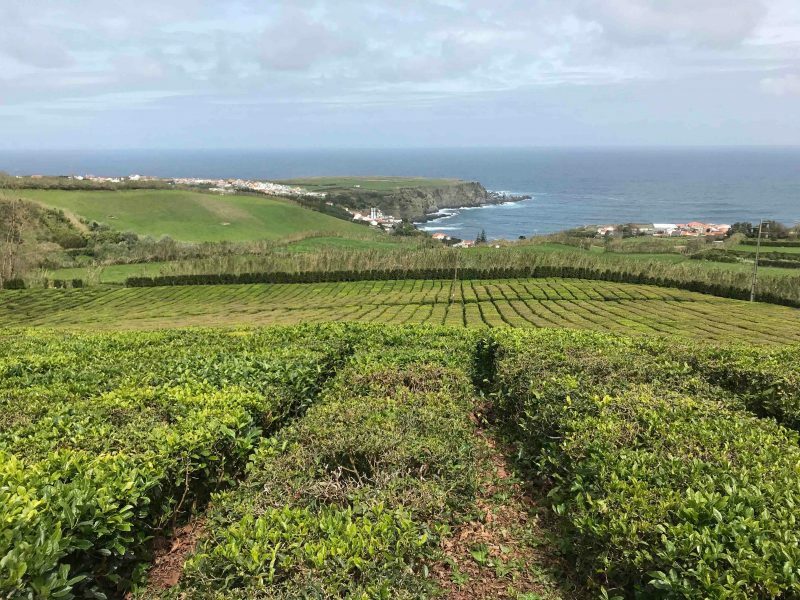 For even more unique agritourism, one of the top things to do in Sao Miguel Azores is visit the Cha Porto Formoso tea plantation near Ribeira Grande. Sao Miguel is the only place in Europe where black tea is produced. The first seeds (camelia sinensis) arrived on São Miguel in the 19th century. Visitors can take a free, guided tour through the entire process of making premium tea, from walking the fields to viewing 19th century processing machinery and sampling Pekoe, Orange Pekoe and Broken Leaf black teas. Ever hiked beneath a rainbow? Adventurous travellers looking for the ultimate in high-adrenaline thrills should plan a guided canyoning excursion through the Ribeira dos Caldeirões Natural Park. Wild ginger, Japanese cedars and create a picturesque backdrop as you rappel, jump and slide down cliffs and through the crystal clear waterfalls of a meandering river canyon. For gentle hiking, the park features walking trails through still-wild landscapes draped by giant tree ferns and waterfalls. Plan to stay at least two hours. 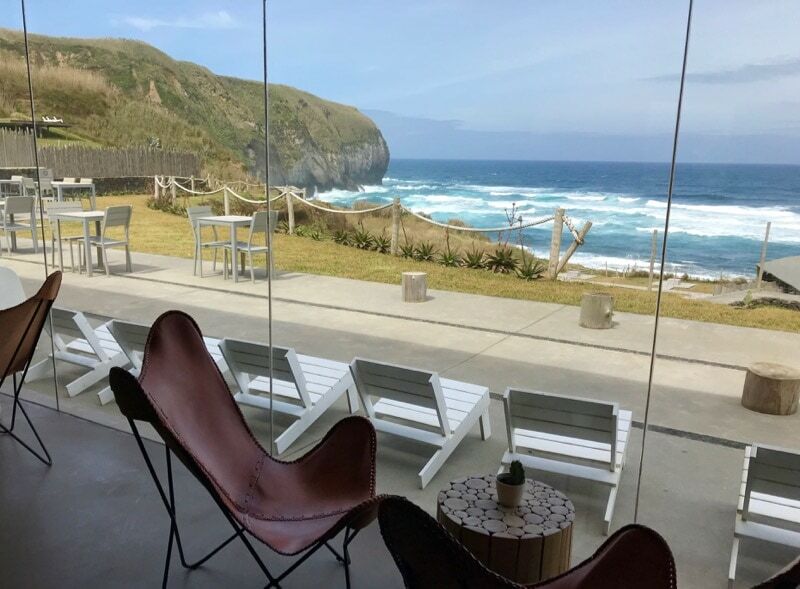 There’s a gift shop, washrooms and a coffee shop tucked inside the Parque Natural da Ribeira Dos Caldeiroes Visitors Centre plus stunning views of the canyon from the open air terrace. Although a bit of a jaunt away along the north coast, its worth making the trip to the Santa Barbara Eco-Beach Resort to enjoy its windswept beach and contemporary cuisine. The town itself is home to the Santa Barbara Church, a structure that dates back to 1485 but was expanded in 1770. This eco-friendly resort is best known for its surfing and outdoor adventure sports. 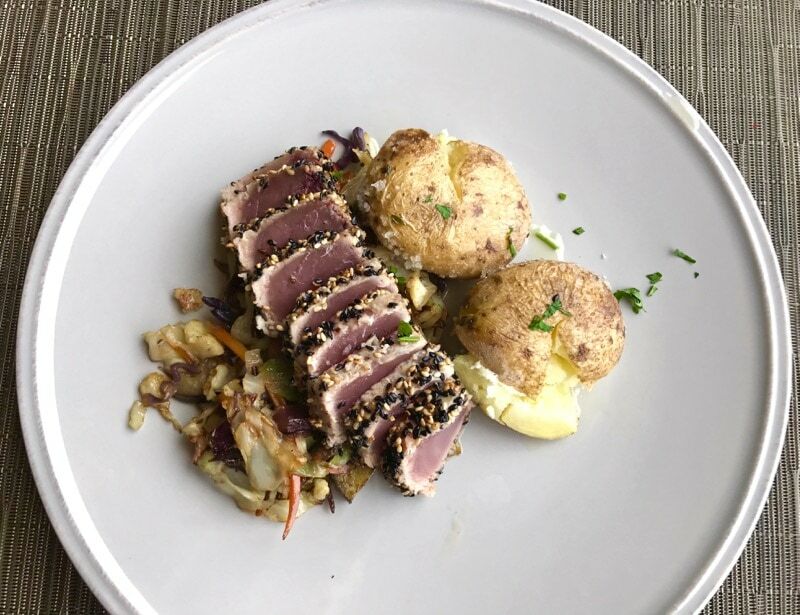 Chill out at the breezy Beach Club and enjoy sushi and sashimi created with fresh locally-sourced fish or a seafood lunch of fresh tuna or catch of the day. Nature lovers will also appreciate stunning Lagoa do Fogo (Fogo Lake), the highest lake on the island of São Miguel. This mirrored lake set within the caldera of a young volcano, is poised 575 metres (1,886 feet) above sea level in the middle of the island. Hiking Fogo Lake’s well-marked trails is one of the top things to do in Sao Miguel Azores as its a scenic way to experience its unique beauty. The easy paths meander through mossy channels and beneath fragrant forests of juniper, laurel and heather. After a Fogo Lake hike, relaxing pleasures await at Caldeira Velha, a waterfall and hot springs on the northern slope of Fogo Volcano. Here you can soak in iron-rich waters or plunge beneath a cascading waterfall set within the Azores UNESCO Global Geopark, a protected area of volcanoes, calderas, lakes, lava fields, fumaroles, thermal waters and volcanic caves. Another fascinating day trip from Ponta Delgada takes you along winding roads flanked by hedges of hydrangea to the Furnas Valley where you can experience a rewarding immersion into the volcanic history of the Azores. 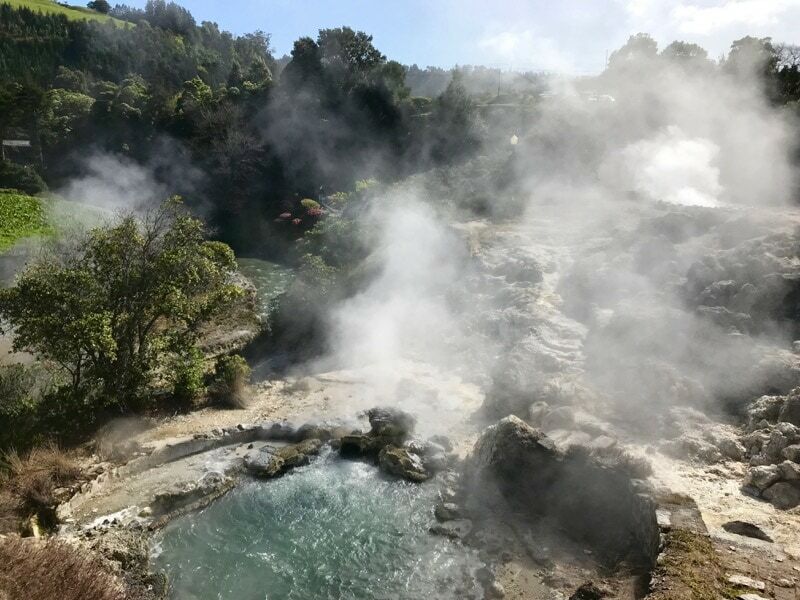 The Furnas Valley, home to a jade green lake, thermal springs and fumarolic fields with openings in the ground where hot, sulphurous steams escape. Roam through this otherworldly landscape, sipping pure, mineral-rich waters from drinking fountains along the way in the town of Furnas, a parish in the municipality of Povoação. Watch for vendors offering tastings of the local fruit liqueurs in flavours such as blackberry, passion fruit and pineapple. Be forewarned that the sulphurous springs are smelly! 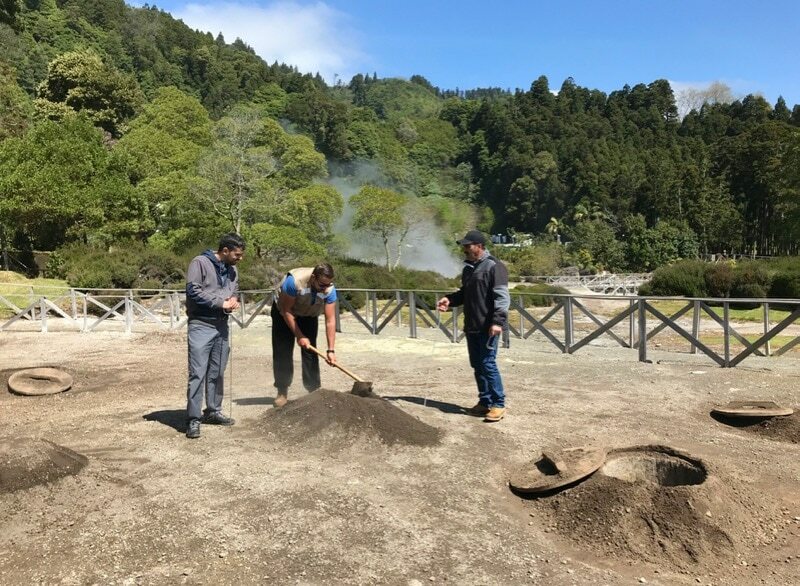 The Furnas Valley is a geo-site known for its thermal fields where locals prepare Cozido das Furnas, a meat and root vegetable dish cooked by volcanic heat in underground pits. It’s fun to watch them withdraw their pots from the subterranean ovens each day at 12:30. 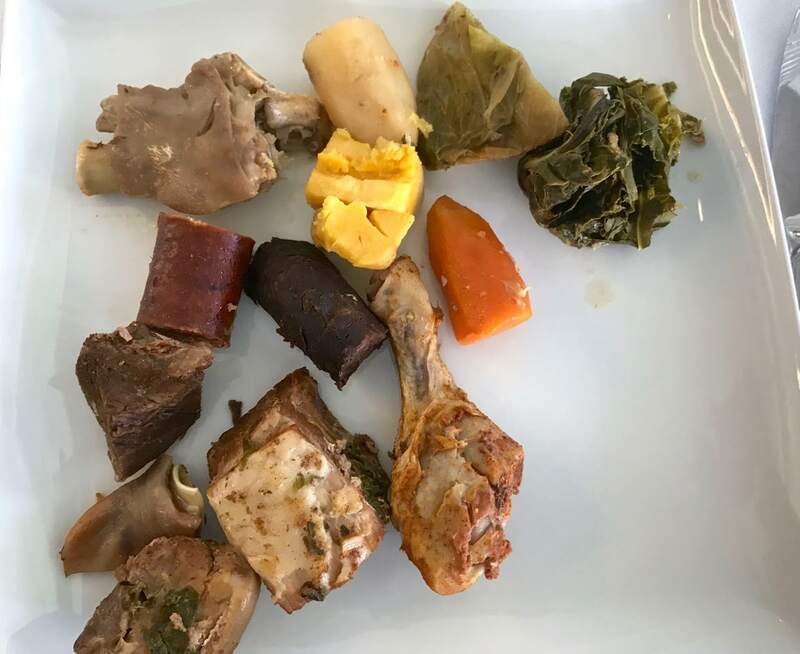 Set among cobblestone streets in the heart of town, the art deco Terra Nostra Garden Hotel is one of the top place to sample Cozido das Furnas, a regional dish of beef, chicken, chorizo and kale steamed underground by volcanic heat. Each chef’s recipe is different and Terra Nostra’s version is deservedly the island’s most famous. This traditional lunch is often served with queijadas da vila, a sweet pastry made of egg yolks according to a recipe created by nuns of the Convent of Santo Adre in the 16th century. The Terra Nostra Garden Hotel also happens to be located next to Parque Terra Nostra or Terra Nostra Park, 18th century botanical gardens where thermal waters cascade from fountains into an open-air bathing pool. This means that after your lunch of cozido, you can soak in iron-rich hot springs is set among a forest of 2,000 trees. 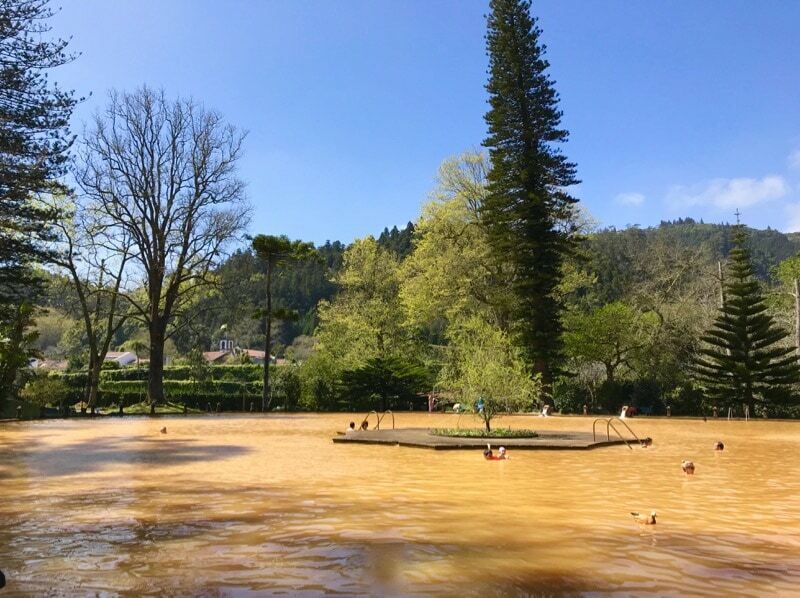 To be honest, these were not my favourite thermal waters in the Azores….they weren’t very hot and it was a bit unsettling to be swimming with ducks and other birds. But my husband loved them as he enjoyed the mineral-rich waters. If you do go to Terra Nostra Park, be sure to wear a dark coloured bathing suit if you plan to soak in the thermal waters. The iron-rich minerals will permanently discolour light fabrics. Also be sure to take a blanket or a large towel so you can lie under the towering trees and soak up the fresh air and sunshine. 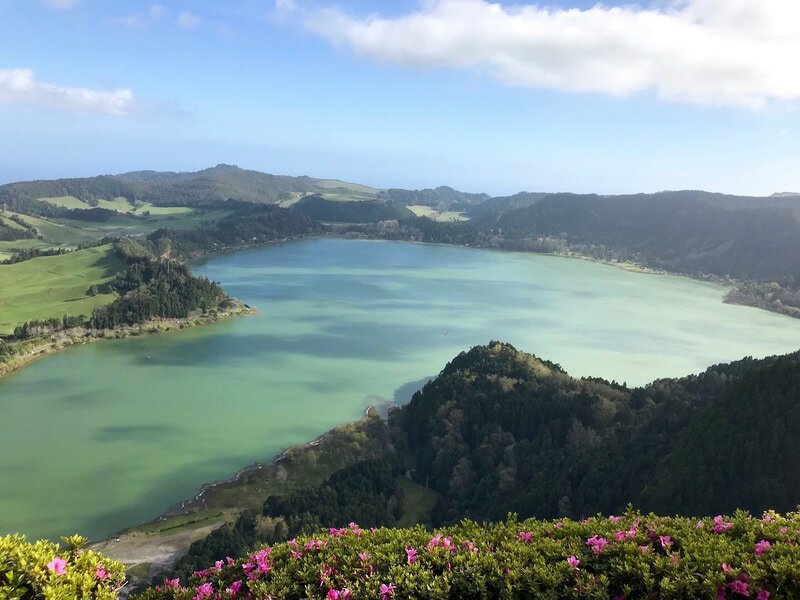 When it comes to stunning backdrops, a must-see on any Azores vacation is Lagoa das Sete Cidades, one of the seven natural wonders of Portugal. 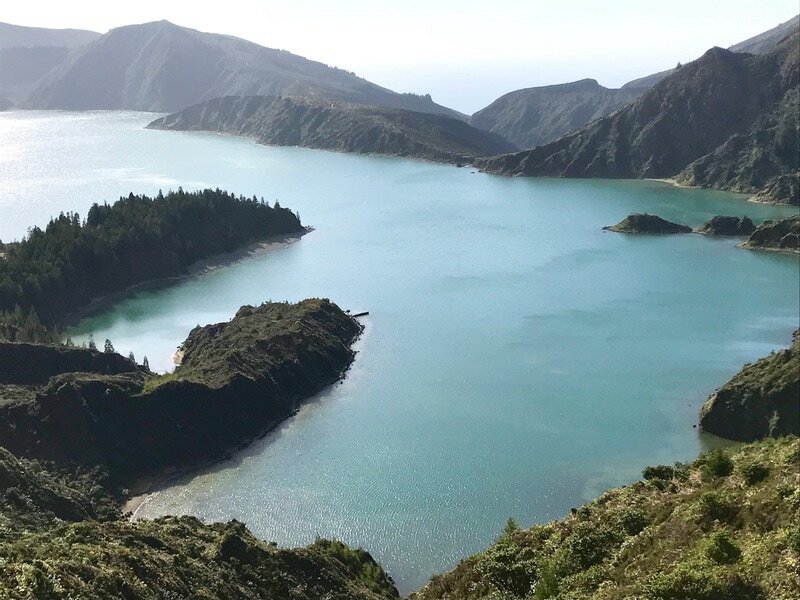 The largest freshwater lake in the Azores, this beauty is situated within a crater at the top of a dormant volcano on the western point of São Miguel island. Ancient legends say that this twin set of turquoise blue and bottle green lagoons were formed from the tears of a green-eyed shepherd and a blue-eyed princess who shared a forbidden love. In modern days, it’s known as a perfect setting for couples’ photography shoots. The best viewpoint (and backdrop for photos) can be found at Vista do Ri Lookout (King’s View) named after King D. Carlos and Queen D. Amelia to commemorate their visit to Sao Miguel island in 1901. The last monarchs of Portugal, they were known for their love of the sea, floral gardens and beauty. A must-see on the western coast is Ponta da Ferraria, a natural thermal pool set in the sea among basalt rocks. Enjoyed by lovers since the 15th century, its attraction is the unique opportunity to bathe in steaming volcanic waters in the ocean at low tide. For an especially magical afternoon, be sure to book a massage treatment at Termas da Ferraria, a full service spa featuring serene indoor and outdoor baths, hydrotherapy pools and private treatment rooms. To experience the scenic splendor of the Azores coastline, it’s also worth adding some whale and dolphin watching to your Azores itinerary. The Azores are one of the world’s largest whale sanctuaries and it’s possible to spot more than 20 different types of resident and migratory species, including the rare right whale and giant blue whale. Another option for your holiday is to go island-hopping and visit some of the nine islands of the Azores, divided into three groups. The island of Terceira is the second largest and second most populated island in the Azores archipelego. Here’s a round-up of the best things to do on Terceira. If you didn’t go island-hopping, this is a day to catch up on all the things you meant to do on Day One of your 7-day Azores itinerary, but didn’t have a chance to do! If you’re staying at the Azor Hotel, you’ll be just steps away from several churches and other buildings notable for Baroque architecture featuring black basalt and white limestone. These distinctive stones also figure prominently in the intricate patterns of the calçada portuguesa (Portuguese cobblestone pavement mosaics) along Ponta Delgada’s picturesque streets. 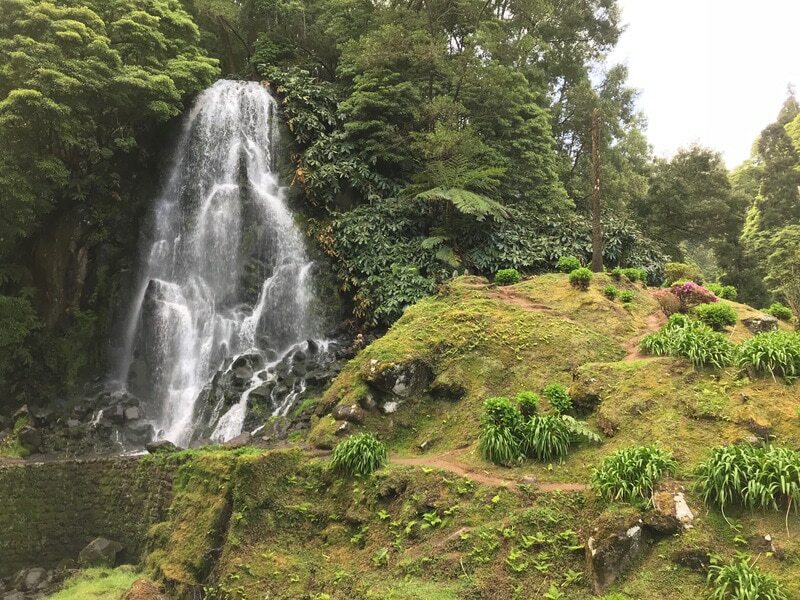 If you’re craving nature, other picturesque green spaces to explore in Ponta Delgada include the Antonio Borges Garden and the Jose do Cando Garden, conceived by the botanist who introduced both the pineapple and tea to the island. In addition to its abundance of botanical species including 6,000 species of trees, it features manicured grounds and Victorian gardens. Whether it’s basking on a black sand beach or hiking through cedar-scented forest to a thermal pool, the island of São Miguel within the Azores island archipelago offers a uniquely satisfying nature and food-fuelled escape. 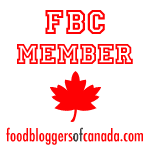 Disclosure: This post contains affiliate links to products we think readers will enjoy. Read more on our Disclosure Page. All this rugged natural beauty doesn’t mean you’ll be roughing it on your holiday in the Azores. Across the island of São Miguel, there’s a fine selection of luxury hotels offering dreamy settings at surprisingly affordable prices. How does lunch for €15 EUR or a luxury hotel with sea view and fabulous breakfast for €125 EUR sound? Unless you really splurge on eating out, the biggest expense will likely be the cost of your accommodation. All of the hotels on our list cost between €100 and €175 EUR, some are much less than that. Another expense to budget for is excursions to the attractions. Again, these are quite reasonably priced. For example you can expect to pay €75 EUR per person for a full day guided excursion to Furnas including lunch, transportation and the services of a licensed guide with Azores GreenMark, one of the companies we used in Azores and were very happy with. You can save money when booking a hotel in the Azores by checking prices on Hotelscombined.com. 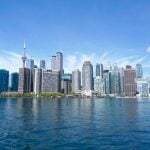 This free search engine compares prices on Expedia, Hotels.com and other major hotel websites and shows you the best (and lowest) prices. Azore Hotel: One of the most centrally located boutique hotels is the modern Azor Hotel set overlooking the marina and seaside promenade in Ponta Delgada. 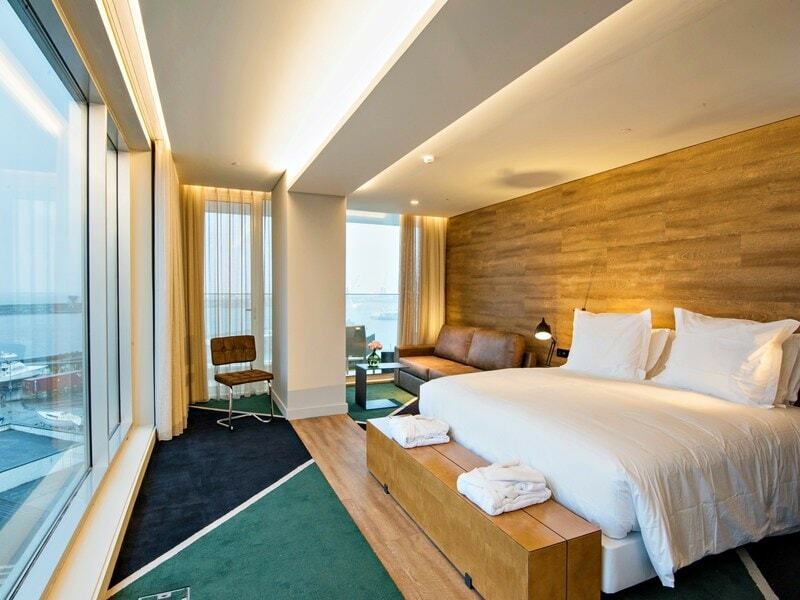 Opened in 2016, this luxury design hotel features rooms with sea views, sleek washrooms with rain showers and a rooftop swimming pool. We stayed here for a full week and really enjoyed the cuisine, the rooftop bar and modern guest rooms. The location was also within easy walking distance to major sights. Foodies won’t be disappointed with a stay at the Azor Hotel. Its acclaimed kitchen at À Terra restaurant features its own bakery, a wood-fired oven and carefully prepared regional specialties. A full Azorean breakfast is definitely a highlight of a stay at the Azor Hotel. Order a la carte or opt for the fabulous buffet. Guests fuel up with São Jorge cheese at the Cheese Corner ( yes, believe it…there’s even a whole section of the buffet dedicated to cheese ), locally-grown pineapple and bolo lêvedo, the popular saucer-sized sweet muffin drizzled with honey. Hotel Rates (including breakfast and taxes) range between €100 to €150 EUR per night. Click here for the best prices on the Azor Hotel. À Terra Restaurant and Rooftop Bar: After a full day of fresh air, indulge in cocktails at the Whale Watching Bar, a rooftop lounge at the Azor Hotel where the sunset puts on a spectacular display across the Ponta Delgada marina. 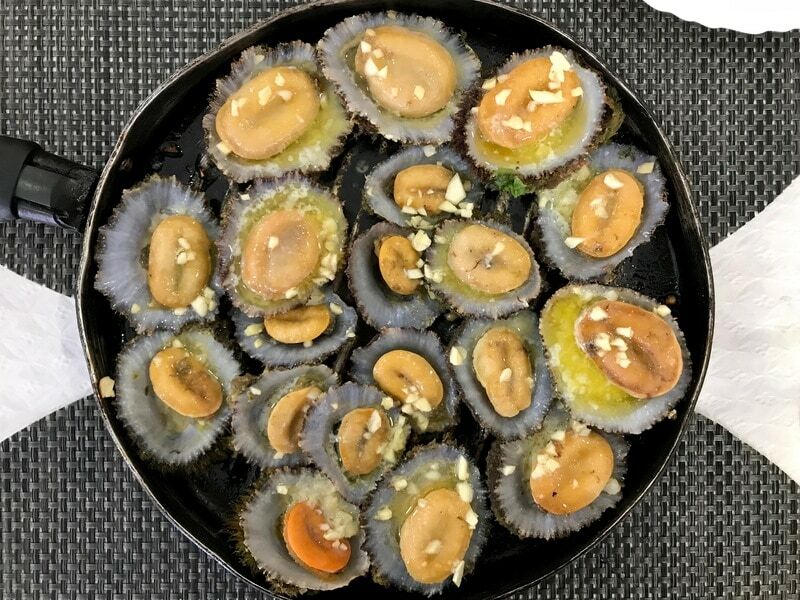 Opt for appetizers such as lapas (barnacles) served on volcanic stone. Alcides Restaurant: Stroll to the Historic Centre of Ponta Delgada for an intimate candlelit dinner at Restaurante Alcides set within a historic wine cellar in the San Sebastian neighbourhood. 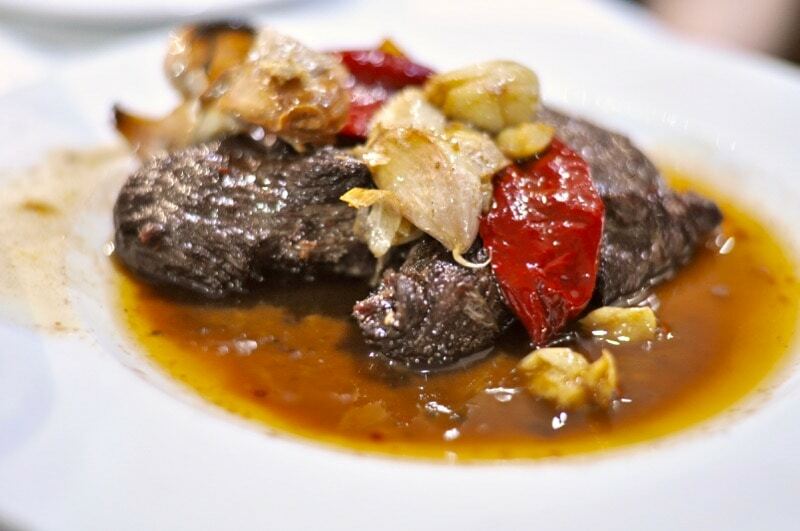 This family-owned restaurant is famous for being the best place in the Azores to sample Bife à Regionala an Azorean steak that’s a traditional Portuguese dish featuring sirloin or rib eye steak marinated in red wine, garlic and fragrant bay leaf and red pepper. At Alcides, the Bife Alcides is an enormous slab of juicy, tender meat packed with flavour. It comes in two sizes 270gr to 320gr for €19 EUR and 215gr to 230gr for €15 EUR. 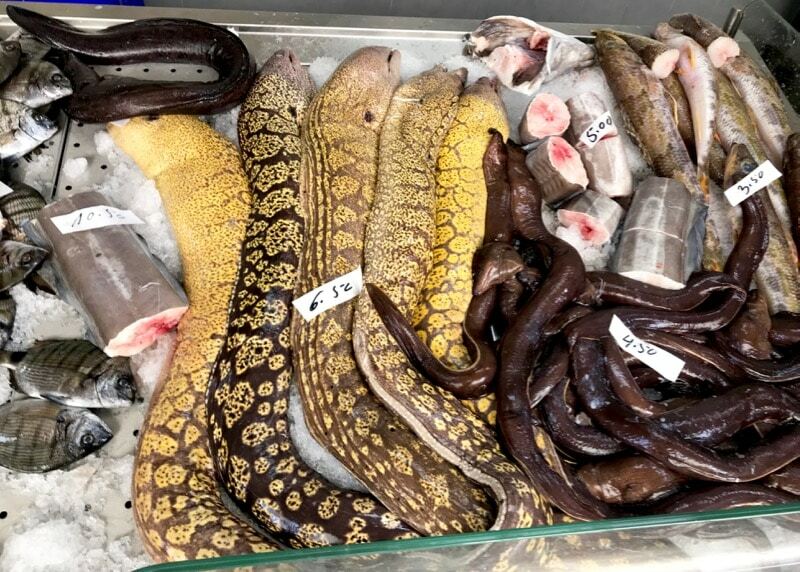 Seafood such as swordfish, cod and other regional specialties are also available. Visit the Hotel Alcides website or ask your hotel to call and make a reservation. 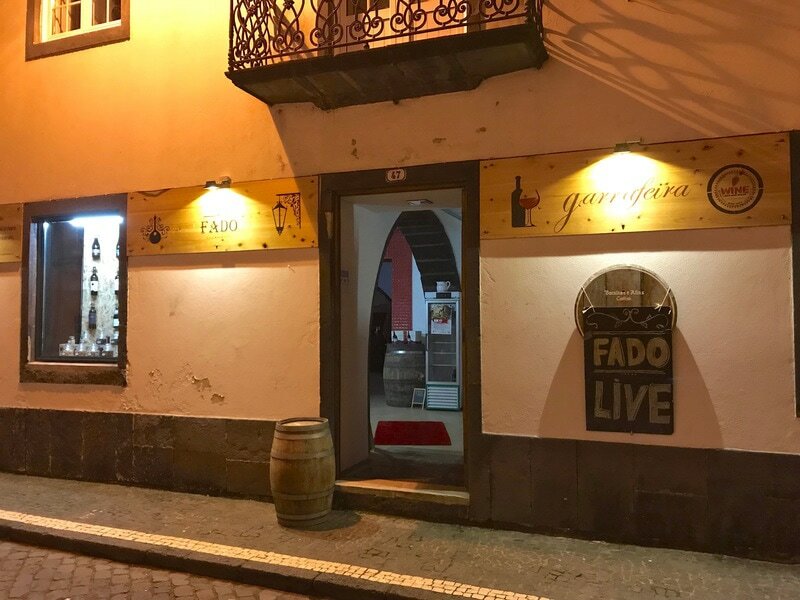 Another option is to dine at the Casa do Bacalhau where entertainment includes Fado, the soulful Portuguese love ballads performed by singers accompanied by classical guitarists. The simple yet satisfying meal features bacalao (salt cod), salad, rice and dessert. Be sure to reserve in advance. Although you can easily stay in Ponta Delgada for your entire stay (like we did) and make day trips for hikes, attractions and sightseeing, it’s also worth spending a few days in Povoação located 60 kilometres (37 mi) east of Ponta Delgada. 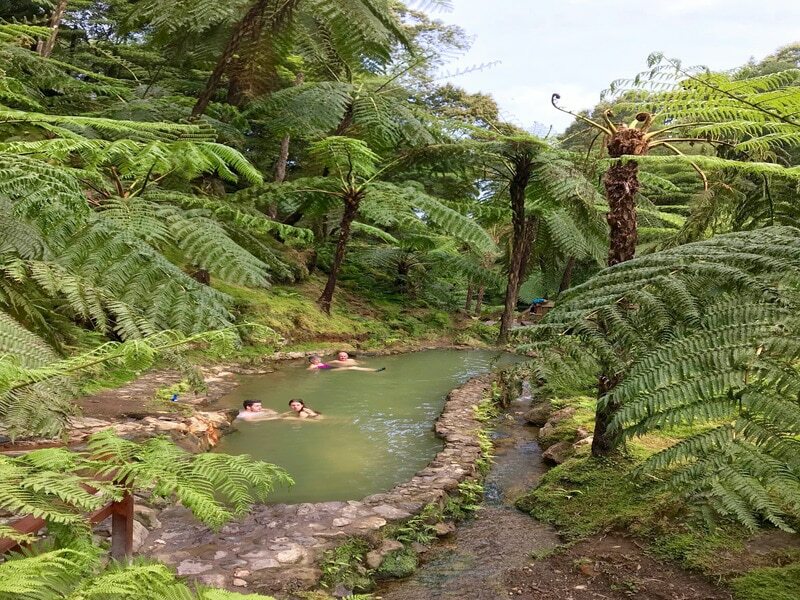 The municipality is located amid the semi-active craters of the Furnas and Povoação volcanoes, circled by forests, mountains and river valleys where you can soak up the wellness vibe of verdant views and more than 22 classified mineral-rich medicinal waters. 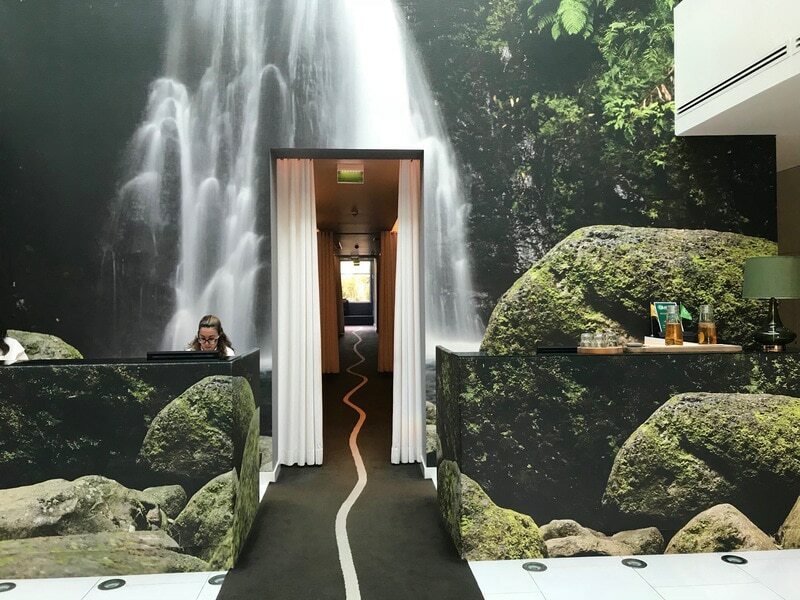 Furnas Boutique Hotel and Spa: A top luxury hotel with hot springs is Furnas Boutique Hotel, a sister resort to the Azor Hotel in Ponta Delgada. Here, the volcanic waters emerge from their subterranean source at such fiery temperatures the healing waters must be cooled before being filtered into the pool. 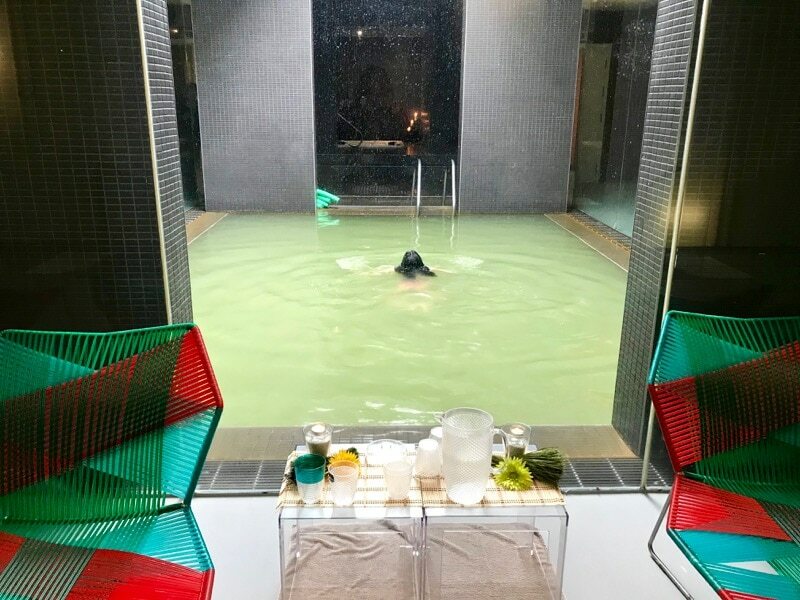 Guest rooms are smaller than those in the Azor Hotel in Ponta Delgada but the modern outdoor swimming pool and an indoor swimming pool set within an airy atrium offers guests opportunities for relaxation and rejuvenation in an idyllic setting. Hotel Rates (including breakfast taxes) are around €100 EUR per night. Click here to check for the best rates on Furnas Boutique Hotel. Terra Nostra Garden Hotel: Enjoy privileged access to the Terra Nostra Botanical Gardens and outdoor Hot Spring Water Pool during a stay at the historic Terra Nostra Garden Hotel. I didn’t see the guest rooms so can’t vouch for them personally, but based on my afternoon at the property it seemed a very luxurious and well managed luxury hotel. It’s important to note that the hot springs are open to the public so it’s not as private as you might want. Hotel Rates (including breakfast taxes) are around €175 EUR per night. Click here to check for the best rates on Terra Nostra Garden Hotel. The islands of the Azores are closer to North America and Europe than most people think. Located in the North Atlantic Ocean, they are two hours from mainland Portugal and a little over five hours from the North American continent via Azores Airlines (formerly SATA). Azores Airlines offers flights to Ponta Delgada on São Miguel Azores, three to five times a week direct from Toronto as well as direct from Montreal from June to September. Flights are also available from Boston. Love food and travel? Don’t miss a post! Sign up for our free monthly newsletter. 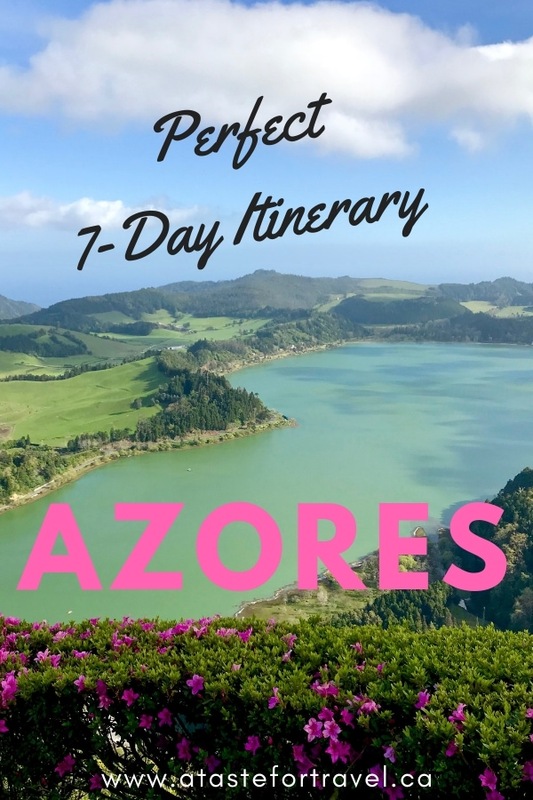 Super helpful Azores itinerary! I see those discount fares all the time and wonder what I could put together to do while there – now I know! Yes, Azores Airlines often has fantastic deals to the Azores! We went to Madeira on our island-hopping adventure and it was super easy to do from the Azores. Wow! Your photos are all gorgeous. But that one of the island of Sao Miguel near the beginning of your post made my jaw drop! I had no idea the Azores was such an amazingly beautiful area. It’s definitely stunning! Lots of people are visiting the Azores for wedding and engagement photos for the incredibly scenic backdrops. What a great review! Looks like there is so much to do (and taste) in the Azores and the price really seems right. I love going to Portugal because the flight seems so short compared to other European countries. The Azores are definitely on my list now! It didn’t take very long at all to get there from North America which is fantastic for someone like me who can’t sleep on airplanes! I didn’t realize it was only a 5 hour flight. Tempting to fly there just to try that delicious looking breakfast! Any breakfast with a cheese corner gets my vote! Thanks for this comprehensive reminder about visiting the Azores. My brother-in-law was born in the Azores although I don’t believe he has returned to visit. He and my sister now live in California, so it’s a little more of a commitment to get there than from the east coast of the US where we live. I’ve pinned this to my Portugal PInterest board so I can keep track of it. It will definitely be something I’ll look for if we ever make it there. You have combined food and attractions well in this post. I am now getting drawn to culinary delights. My hubby would love that tuna…perfectly cooked…and I wonder if that cocido is like the one we have in the Philippines which is also Spanish-influenced. What a comprehensive guide. I have great memories of my visit. Consider this post bookmarked for our journey to the Azores, which I hope is sooner than later. I simply loved my visit to Portugal and know I would adore the Azores just as much. That seafood alone would be worth the trip! 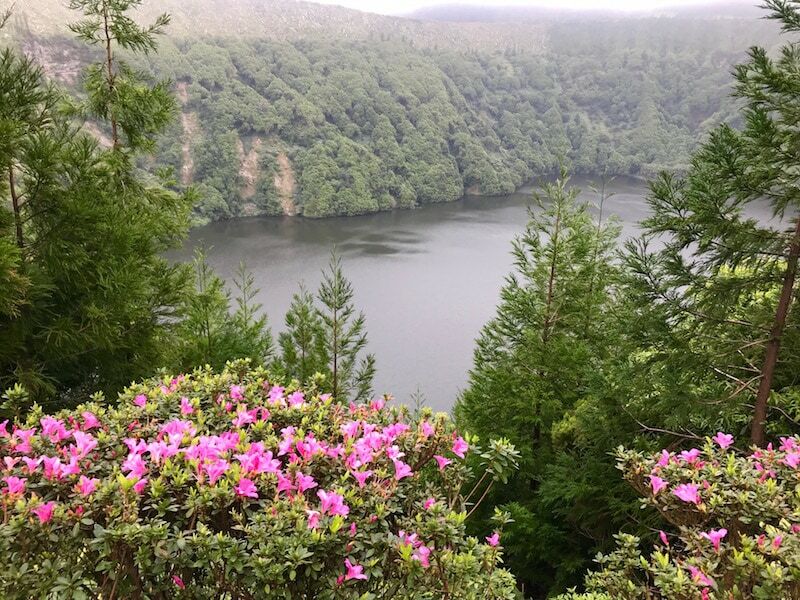 We loved the Azores—the food, the hot springs, visiting a tea plantation—but this post makes it clear we didn’t stay long enough and need to go back! Great tips. Hopefully you’ll be back in the Azores again soon! I love all the water aspects of the Azores! You don’t have to go to a spa, it sounds like there are several outside opportunities to sit in warm water, or hike under a waterfall or sit in a thermal spring and see lovely nature while you do it. What a beautiful place! Sign me up!